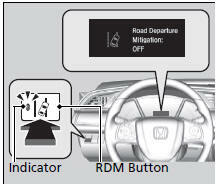 Press the RDM button to turn the system on and off. The indicator in the button comes on and the message appears on the driver information interface when the system is on. When you have selected Warning Only from the customized options using the audio/information screen, the system does not operate the steering wheel and braking.